A few things in life still remind us of the good feelings of simpler times. Werther's Original is one of them. 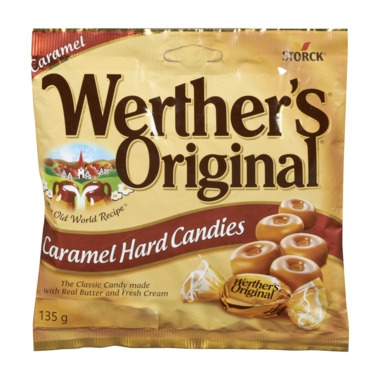 Today, Werther's Original is made in the same tradition with the Old World recipe, high-quality ingredients and classic taste - which is why this delicious and unique classic cream candy has become so popular all over the world. Werther's Original – what comfort taste like. Ingredients: Sugar, glucose syrup (from wheat or corn), cream, butter, whey, salt, emulsifier soy lecithin, artificially flavored with vanillin.